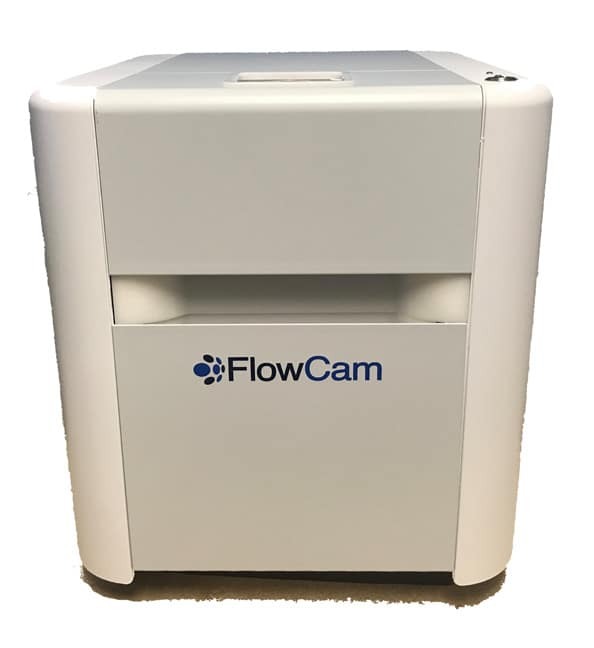 Since its first introduction in 1999, FlowCam has become a valued and accepted instrument for marine and freshwater research. With over 300 instruments installed worldwide in these applications to date, in prestigious laboratories such as Scripps Institution of Oceanography, Alfred Wegner Institute, Bigelow Laboratory for Oceanographic Sciences, Laboratoire d’Océanologie de Villefrance, and the Chinese Academy of Sciences, the value of FlowCam in research keeps growing. FlowCam represents a combination of an automated microscope for detailed morphological analysis (size, shape, etc.) of algal cells with the ability to additionally add in fluorescence values to further discriminate cell types similar to a flow cytometer. With continuous product improvements driven by customer input, the instrument continues to meet the expanding needs of the research community. For Analysis of microorganisms ranging from 3 µm to 600 µm in size. Automate cyanobacteria dectection from green algae. For analysis of larger microorganisms, ranging from 300 µm to 5mm in size. • Measures particle size and shape – over 40 morphological measurements on each particle imaged. • Provides superior image quality and image-based measurements – fast and accurate results you can see, backed by the quantitative data to prove it. • Gives statistically relevant results quickly – allows user to look at tens of thousands of particles per minute. • Allows automated, trainable, statistically-based pattern recognition – saves time by isolating different types of particles into categories and sub-populations. • Delivers accurate results on all particles from 1 µm to 2 mm (count) and 4 µm to 2 mm (shape). • Cross-polarised illumination option allows for isolation and quantification of particles that exhibit birefringence. • New Auto Focus feature provides convenient, repeatable focus. The FlowCam imaging particle analysis system contains three core technologies: optics, electronics and fluidics. 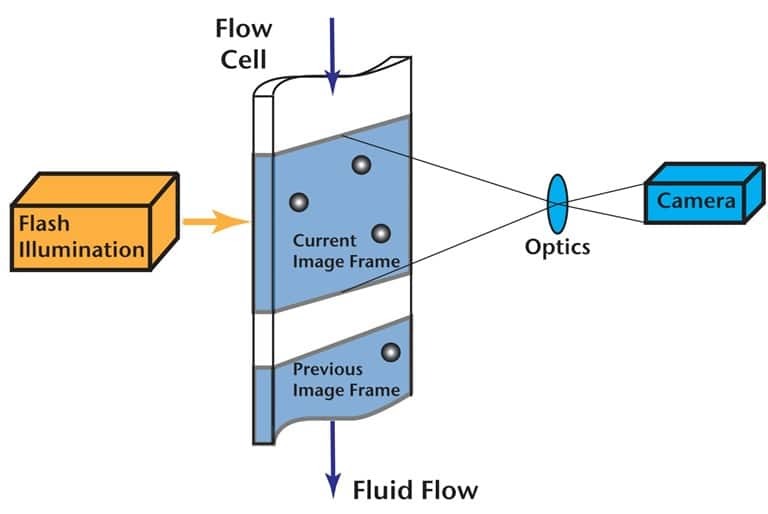 The optical system is similar to a microscope, and is used to capture real-time images of the particles in the fluid as they pass through the flow cell. Additional optional electronics can also capture two channels of fluorescence information per particle. The fluidics system uses an ultra-high-precision computer controlled syringe pump to pull the fluid sample through a flow cell perpendicular to the optical path. VisualSpreadsheet is a powerful software that allows you to interact with the particle images captured with the FlowCam. Improving on other particle analysis systems that only allow you to sort and filter rows of numeric data, VisualSpreadsheet gives you the ability to sort and filter actual images. Ultimately this gives you a more in-depth analysis of your sample and a better understanding of your data. Immediately find and display all similar-type particles in a heterogeneous sample with sophisticated pattern recognition capabilities. 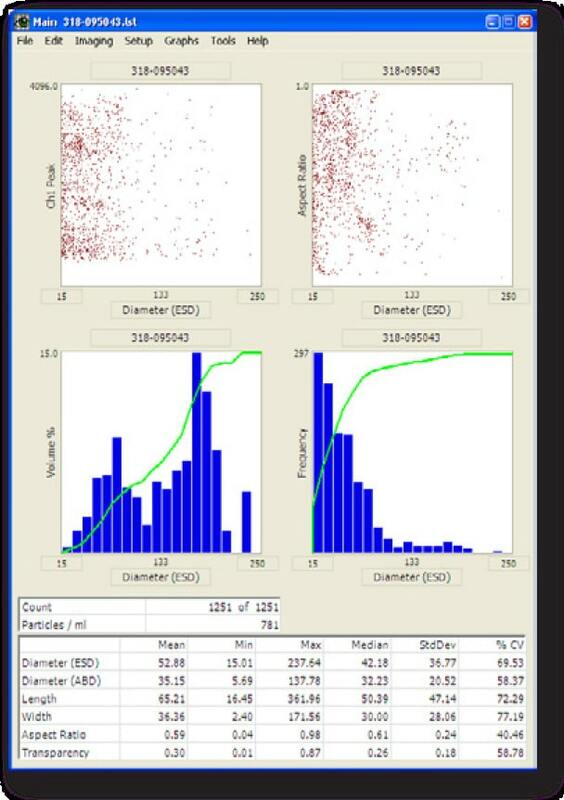 You can also create and save defined particle type libraries, then compare incoming FlowCam data against one or more libraries to instantly enumerate concentrations of specific particle types. 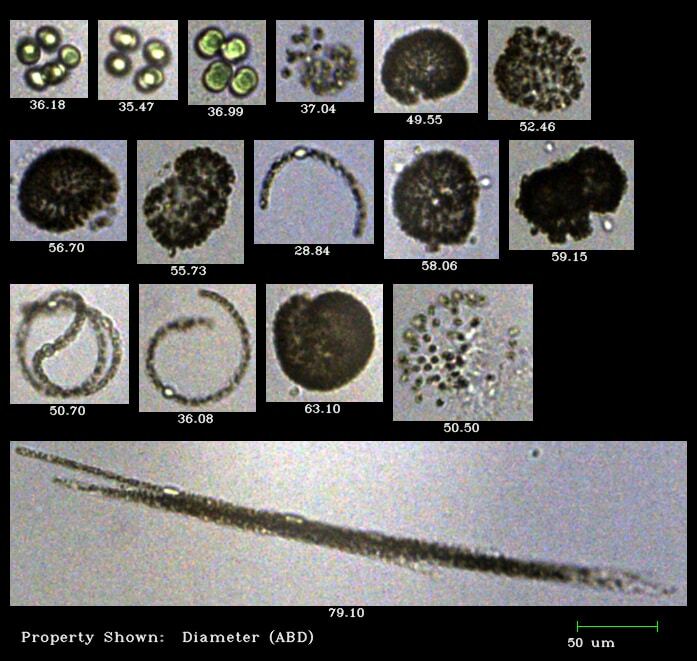 Identify, enumerate, and classify plankton and other particles. Obtain size, shape, fluorescence and concentration statistics in a fraction of the time required by traditional microscopy. 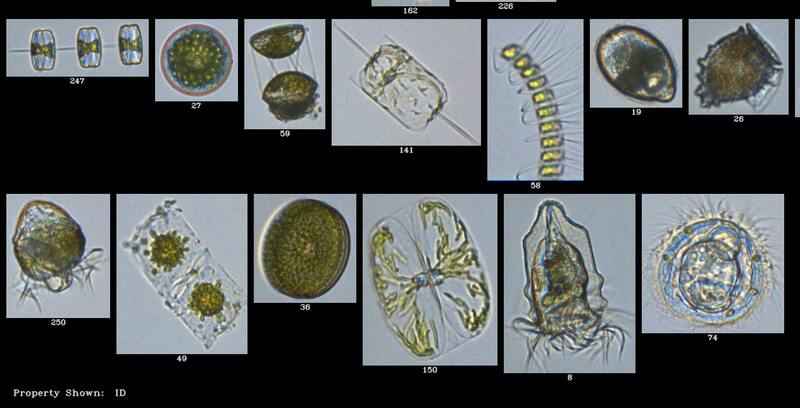 Live plankton sample from the gulf of Maine imaged by the FlowCam at 10X. 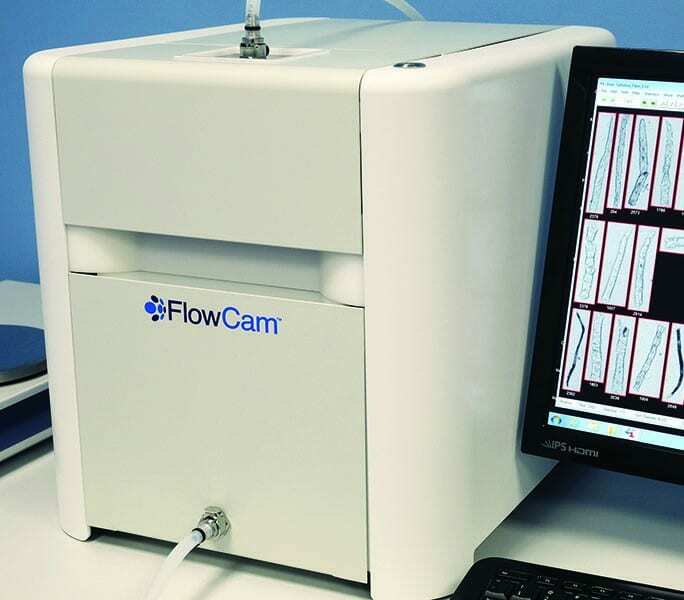 The FlowCam Cyano automatically differentiates cyanobacteria from green algae. Equipped with a red laser and two fluorescence channels, the FlowCam Cyano measures the fluorescence signals of chlorophyll and phycocyanin of each organism. Cyanobacteria (phycocyanincontaining) are differentiated from green algae (phycocyanin-absent) using the ratio of chlorophyll to phycocyanin calcuated by VisualSpreadsheet for each organism. Quickly detect, quantify, and characterise cyanobacteria and green algae using over 40 measured morphological parameters. Freshwater sample sorted by chlorophyll-to-phycocyanin ratio value, noted beneath each image. 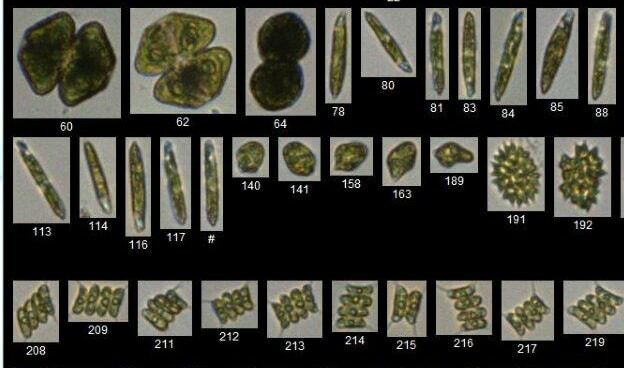 Cyanobacteria (bottom row) show positive ratio values and green algae (top row) show negative ratio values. Quickly monitor the quality of your drinking water sources. Detect and identify cyanobacteria, filter-fouling algae, taste and odor algae, and other nuisance algae. The FlowCam and its paired analytical software VisualSpreadsheet digitize algae enumeration, calculate the concentration of each taxa, and characterise and sort data by over 40 measured morphological parameters. 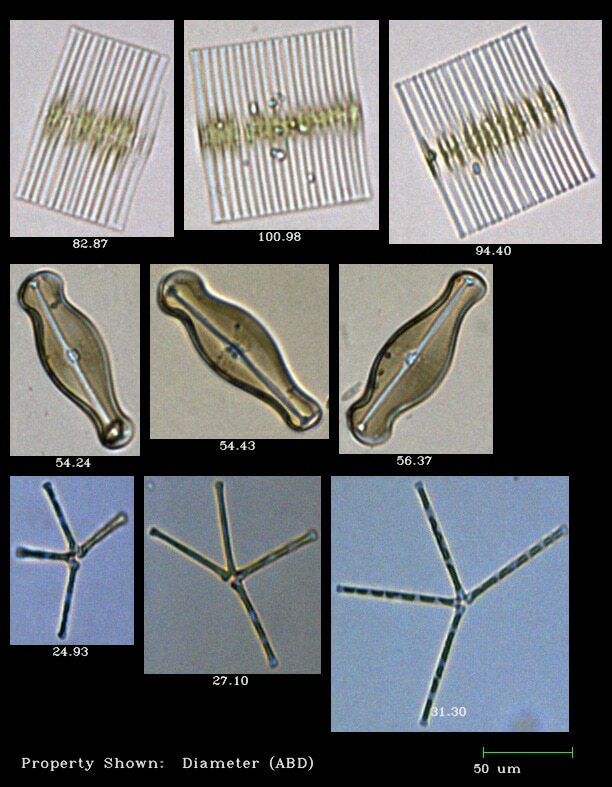 Cyanobacteria (Above) and filter-clogging diatoms (right) imaged at 10X. Protect your algae crop. Measure all the metrics you need to ensure your culture is healthy using the FlowCam: track rotifer and other biological invader contamination, monitor culture health by tracking cell size distribution and concentration, perform life cycle analysis and live/dead population analysis. The FlowCam will also characterise astaxanthin concentration using colour metrics, analyse lipids using stains and fluorescence, and perform life cycle analysis and live/dead analysis. Cosmarium, Euglena gracilis, Pediastrum, and Scenedesmus imaged at 10X. The FlowCam offers high-speed analysis of ballast water samples for indicative monitoring in support of IMO Regulation D-2. Onboard the ship or portside, detect, image, and count microorganisms in a discrete sample or a continuous flow. The FlowCam offers two different but interrelated capabilities for indicative monitoring: a rapid method for measuring total particleconcentration and/or an image-based approach for determining treatment efficacy.